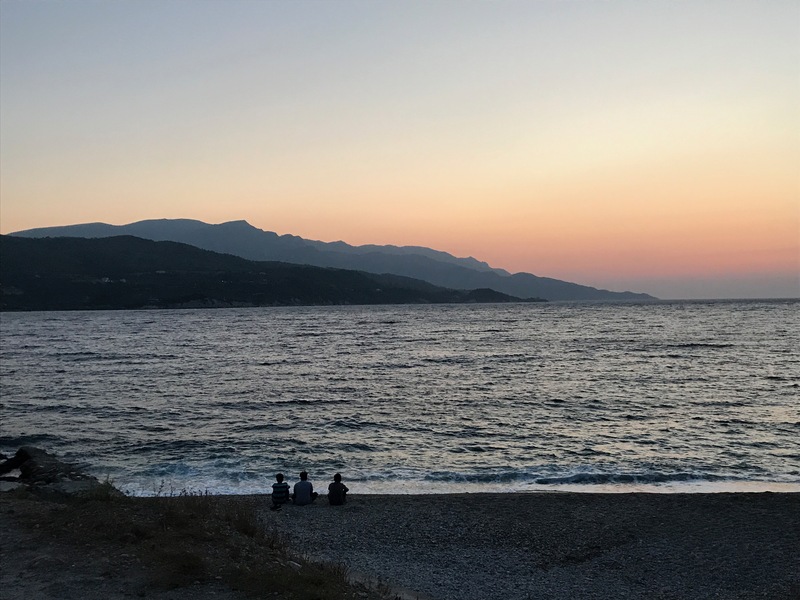 This piece introduces a series addressing several issues I saw during my time at a refugee camp in Samos from June-August 2017, including mental health, children in the camp, criminal justice, the asylum process, and more. For anyone interested in supporting the refugees and Samos Volunteers, the situation on the island is getting worse every day. Head over to www.samosvolunteers.com to learn how to donate or volunteer. Jamal scampers toward me, wearing a red Michael Jordan t-shirt and slip-on sandals a few sizes too big. He is thin, as are most of the children in this refugee camp. I think he is around thirteen, but my fellow volunteers and I are not sure. In his broken English (which is still better than most of the kids), he yells to me. “My friend!”, he shouts, “NBA!” He trips on his shoes as he attempts to shoot an imaginary ball over a tree branch. Toddlers watching from the sidelines giggle as Jamal picks himself up with a toothy grin. In the background, an old woman sobs next to the camp’s police station. I heard through the volunteer grapevine that her son was jailed last night, but I do not know why. A few policemen hover around her. Welcome to Samos, and to the camp that houses the second-largest refugee population in Greece. I left Europe in the beginning of August after spending six weeks in the refugee hotspot on Samos, a Greek island just four kilometers from Turkey. On a clear day, you can see the Turkish coast from Vathy, Samos’ capital and the location of the refugee camp. I lived in Vathy and spent my time working in camp with an organization called Samos Volunteers, assisting in aid distribution and social programs for the 2,000 children and adults living in the 700-person capacity camp. For the last month, I have mulled over how to describe this experience to other people. When asked how my summer was, I smile and say “amazing!”. I know they do not want to hear about the realities of life in camp. They ask what I learned. I learned how to physically approach someone and exude respect without verbal communication. I learned how to speak with my body, since language was so lacking. I learned around 15 words in Arabic. I learned that children, despite being so vulnerable in situations like these, are extremely resilient: to dust, to lice, to E. coli, and to trauma. I learned, most importantly, that despite unparalleled funding and resources, the aid community’s response to this refugee crisis has been underwhelming and ineffective. The typical excuses for failures in humanitarian aid response do not apply to Greece. Unlike many parts of the world that organizations like the UNHCR operate in, Greece has , stable institutions, reliable infrastructure, accessible technology, and regularly accessible wifi. There is more than enough money: since 2015, over 803 million dollars have come into Greece alone for the refugee crisis. Aid workers feel safe to go into camps and have freedom of movement around the islands they are working on. Despite how many people the islands have been overwhelmed by, there are significantly less refugees in Greece than in other areas of crisis: Iraq has 3.9 million internally displaced persons, Lebanon holds 1,033,513 registered Syrian refugees, and in the Democratic Republic of Congo, there are 922,000 displaced persons. So why are large INGOs, and NGOs like the UNHCR, failing to accommodate basic needs for refugees? One answer to this could be that the number of people coming across the sea far exceeds what Greece and the EU have designated resources for. Today there are over 2,200 people in the Samos camp, which has come to be known as a refugee “hot spot”. The camp, originally intended as an intermediary point for refugees between Turkey and mainland Europe, has been holding many refugees for over a year since they arrived. The population nearly doubled from when I arrived to the island on the 27th of June to the time left at the end of August. The camp’s shipping containers — functioning as housing — have long been overflowing. Families have camped in makeshift tents distributed by the United Nations Refugee Agency, or UNHCR, since last year, living in even more uncomfortable conditions. These tents turn into saunas in the hot summer months, and, in the rainy winter season, many of them don’t survive on the muddy hill the camp is built on. As of September, there are no tents or containers left for new arrivals, so they are sleeping outside the official camp areas on blankets or tarps. I arrived to Samos during a relatively stable time. The waves of refugees arriving is cyclical, and the second half of my time there was characterized by the frantic rush of new arrivals coming every day. My initial reaction was that the camp, despite looking like a prison, was not as bad of a place as I expected. It was easy to not see certain details when I first arrived and was trying to process all the new information around me. I had to learn how to field the varying reactions from different people: the excitement of the kids to meet a new playmate, the curiosity of the young girls at a woman who is a student instead of a mother, and the cautious respect of the men directed towards me. Most of the time, my interactions with the refugees felt the same as any other. Yet there would be moments I was reminded of their trauma, desperation, and frustration: when I had to tell a new mother that I could not give her another pair of shoes for her baby, or holding back the frantic rush for sugar during tea distribution. How do you say no to these people, who grab onto your attention and resources like a life raft? Unlike the language teachers, who taught classes everyday, I participated in many different activities. Most of the volunteers have to wear many hats. I helped with clothing distribution, making tea in the morning and afternoon, sorting donations in the warehouse, and taking the children to the beach for swimming. I spent a lot of time with the children, playing with them in the olive trees just outside the camp gates. The olive trees are not a kid-friendly play space: there are rocks, dirt, and a ledge just a few feet from the play area that many a child falls down during the day. The children are hungry for mental and physical stimulation, and they will play anywhere. We gave them games, coloring books, puzzles, a swing, a football, jumping ropes; not to mention affection and attention, which they desperately crave. In just a few weeks, my refugee friends and fellow volunteers became a second family. Walking through camp with my volunteer badge meant I was treated like a member of the community. Samos Volunteers is respected by the refugees. I learned to feel comfortable opening up to a few of my close friends about parts of my identity I kept silent most of the time, mainly my Judaism and my sexuality. The chorus of “marhaba”(“hello”) and “how are you”’ and the gaggle of children that followed me through camp, tugging on my long pants, warmed my heart every day. Everyone, especially the young adults and unaccompanied minors, wanted to hear about my life in America and my studies at Berkeley. I was happy to share with them, but it pained me to know that I would soon be back in Berkeley and these bright young people were stuck in limbo on Samos. I went on a run at sunset on my last week in Samos. After dark was the only time any form of exercise outside was possible, and the sunset at the bay in Vathy was a sight to behold. I took a different route this time, passing by the beach that we take refugee children to swim in. I saw three boys from the camp watching the sunset on that beach. All of them were around my age, and one I knew personally. His family had come from Syria – Aleppo, to be exact – several months prior. These boys sat watching the sunset for a while. I wondered what they saw in the horizon, half of it covered by the curve of the island and the other half open to the sea. I wondered if they saw themselves in the shape of the sea: half imprisoned, half free. Lily is a writer for the Review Section of the BPR. She is studying Political Science and Public Policy. She grew up by the ocean and appreciates the beauty of the Bay but wishes it wasn't so damn cold. Previous ArticleStatue Statutes: Will Renaming Bring Reconciliation? 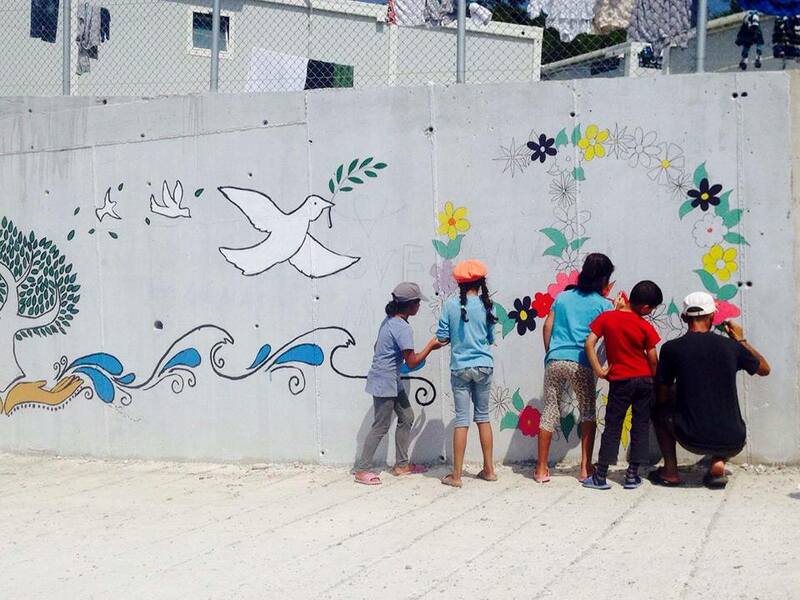 A beautifully written first hand narrative of life as a volunteer in the refugee camps. I believe the writer does not have a hyphen in her name!